While stirring a morning cup of coffee and thinking cosmic thoughts many astronomers would glance at this Hubble Space Telescope image of spiral galaxy NGC 4622 and assume that the galaxy was rotating counterclockwise in the picture. One hundred million light-years away in the constellation Centaurus, NGC 4622's gorgeous outer spiral arms, traced by bright bluish star clusters and dark dust lanes, should be winding up like ... well, like swirls in a cup of coffee. 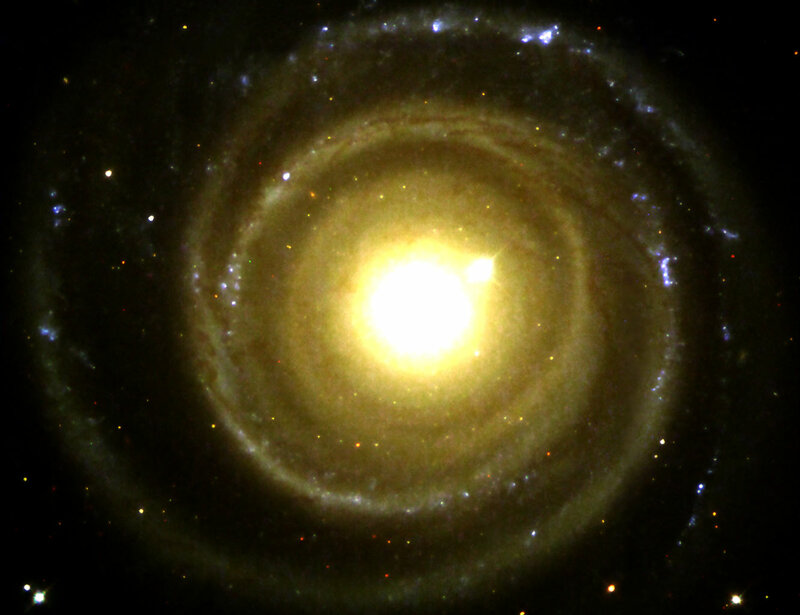 But a closer look at this galaxy reveals that a pronounced inner spiral arm winds in the opposite direction. So which way is this galaxy rotating? Recent evidence combining ground-based spectroscopy and the sharp Hubble image data surprisingly indicates that the galaxy is likely rotating clockwise in the picture, its outer spiral arms opening outward in the direction of rotation. There are further indications that a past collision with a smaller companion galaxy has contributed to this bizarre rotational arrangement of spiral arms, essentially unique among known large spiral galaxies, in NGC 4622.